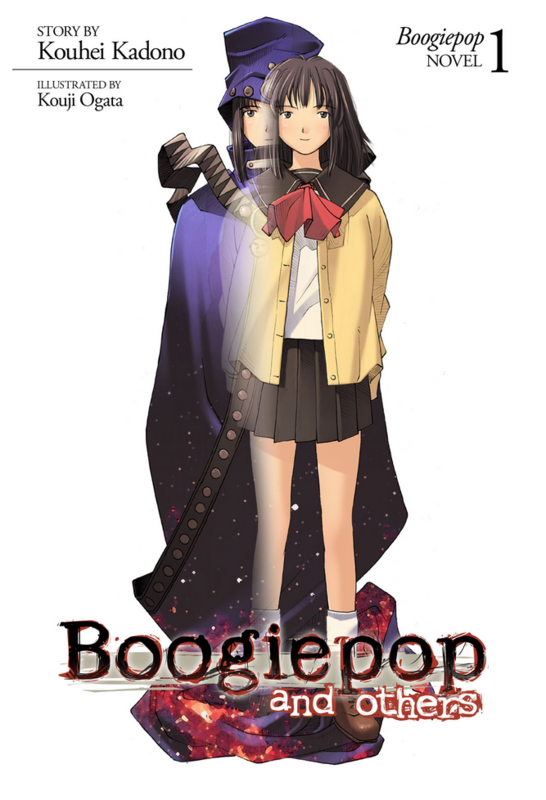 I probably haven’t talked about it before, so I can tell that my story with Boogiepop franchise goes like this. 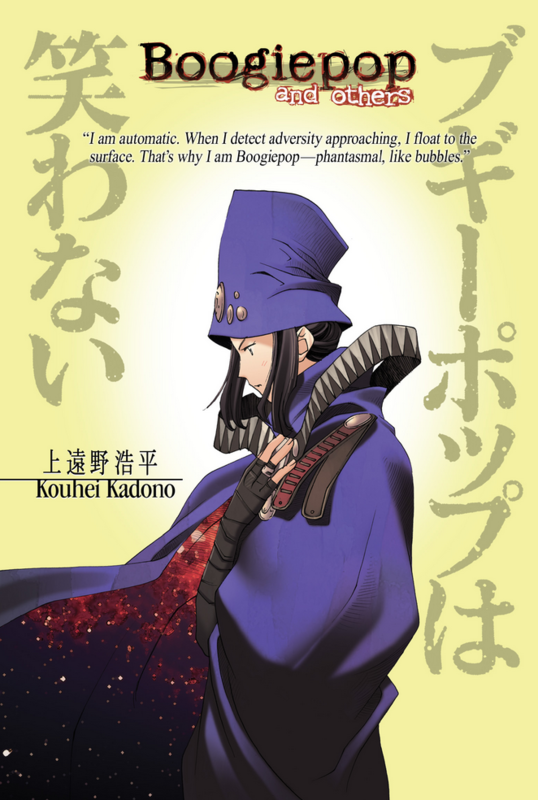 Since I heard that there’ll be a new Boogiepop anime, I decided to finally pick up the light novels. Simply because some regard the franchise quite highly, and dipping a bit in anime (and associated media) history is never a bad idea. (Unless you get stuck on some CG of early 2000s.) Anyway, as always, procrastination did its job, and I barely managed to read the first volume before starting watching the anime. Now, the first arc that was covered in that volume, is already finished, so it’s time for the second one. I can’t say that I caught the train before it even started moving, but still – I think it’s a valid idea to post my impressions of the novels before digging into the adaptation. So, here it goes. Baccano at this point is regarded as a milestone in the history of the medium, be it light novels or anime. The energetic chaos of intertwining stories of many characters definitely is very entertaining, if only you can keep up with it. 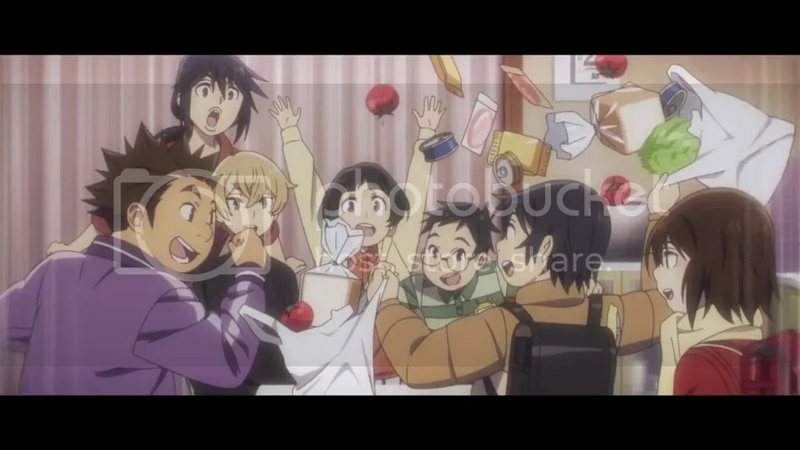 The truth however is that almost nothing pops into existence out of a vacuum, and Baccano isn’t an exception to that. If you think of it as an outgoing youth full of craziest ideas, you should also know that it has a grandfather – older, calmer and usually more grounded in reality. What’s that you ask? 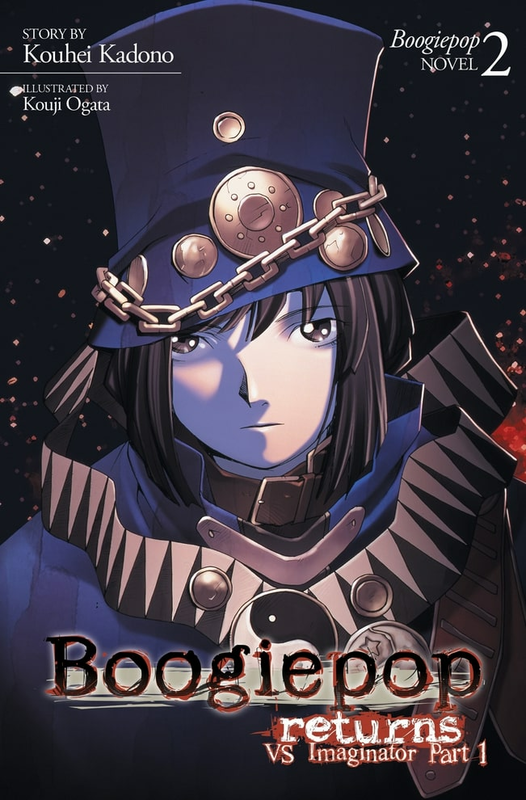 Why, but that’s Boogiepop. Boku dake ga Inai Machi was probably the most notorious anime of Winter 2016 season. 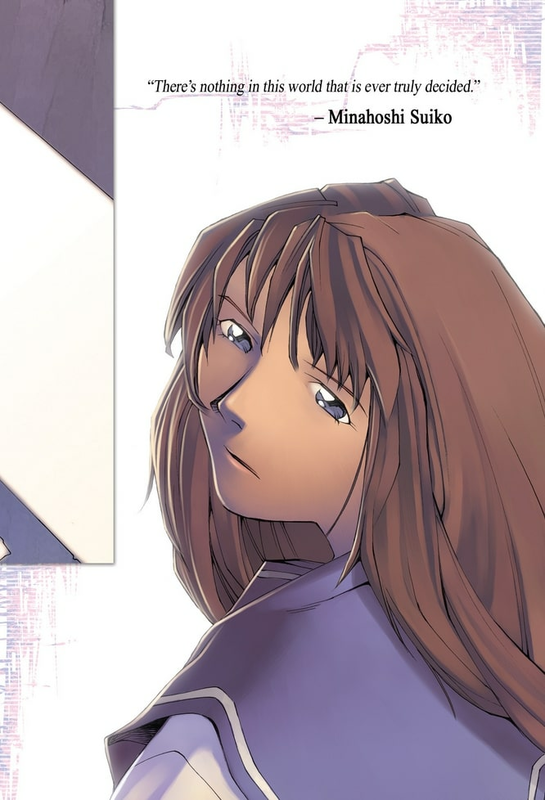 Sometimes it just happens – a story that clearly has potential gets an anime adaptation by a famous studio, the staff also seems to be at least decent or even very good (yes, it’s especially Yuki Kajiura I’m speaking of), some people become interested and that gives a chain reaction so that the hype climbs sky high. Yet, some viewers cool off very quickly and even start to despise the show, while the majority still retains the opinion that it’s really great. Come to think of it – Boku dake ga Inai Machi is truly well made, but still some details restrain me from calling it superb. The first episode wastes no time and introduces us to Satoru, not the very brightest or that successful 29-year-old guy, who has to work as a pizza delivery man because of being unable to start a profitable enough mangaka career. What’s so interesting about him? Well, he appears to have an ability to travel back through time a few minutes and change his behavior so that some ill fortune would be evaded. That’s what became clear after the first episode and sadly even after the last one we don’t know virtually anything more about this ability. 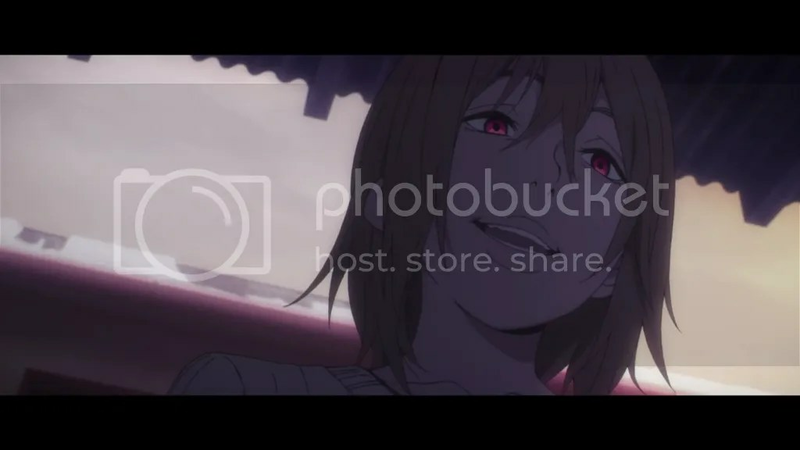 There are some implications that it may activate when Satoru becomes very shaken emotionally but that’s the most what can be speculated about it. Of course, it’s a better choice to leave it at that as sort of a natural thing and don’t pursue any half-baked explanations but I just would have liked to know at least Satoru’s own ideas about why does he have such a power and what exactly it is. Now it remains only on a level of quite a cheap plot device that activates when it’s convenient. Not to mention that one day Satoru’s ability unexpectedly throws him back to his school days when he was only 10 years old. Now in a kid’s body, Satoru decides that this means that he must save his classmate Kayo who was kidnapped and murdered at that time to prevent the cause of why his ability activated (ooh, it’s difficult to evade spoilers). Well, it sounds alright, but when you think of it, if Kayo was so important, why didn’t Satoru’s ability activate earlier so that he wouldn’t need to live pretty much useless two decades? On the other hand, Satoru could have gone just a few minutes back through time in the first place to avoid that certain event that started everything. Not to mention pretty unjustified notion that it’s namely Kayo’s fate that Satoru needs to change. Anyway, our protagonist ends up being a kid and having to befriend Kayo and in this way save her from the murderer. Because of his ability, Satoru is not just a child, but a child with a mind of an adult, though that is handled in a pretty heavy-handed way. One second he may use his life experience to think of ways of dealing with the murderer and then another just start asking his teacher some advice how to become friends with people. Come on, you are a 29-year-old guy, dammit! 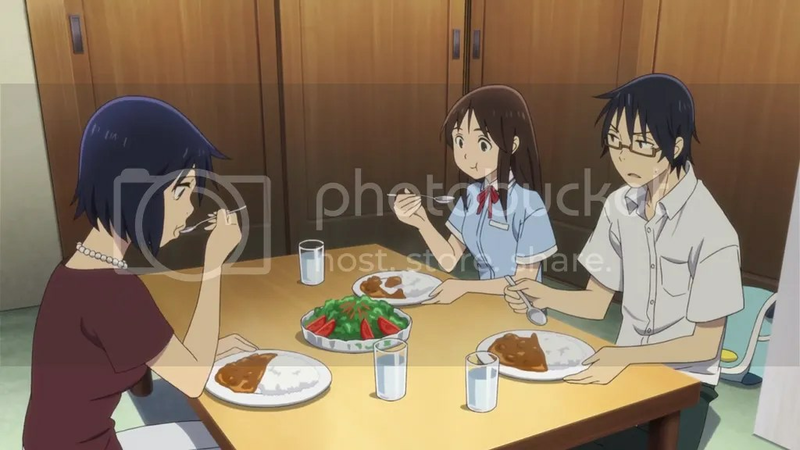 Also, Satoru is portrayed as having at least a bit infatuated with Kayo, on the verge of it being romantic, and I really don’t feel very comfortable knowing that a 29-year-old guy stammers and blushes and goes on a date while holding hands with a 10-year-old girl. I didn’t really appreciate the composition of the show either. All the stuff to do with Kayo went on for the majority of the series but when that arc wrapped up, Kayo was just packed away to appear only in the very end. 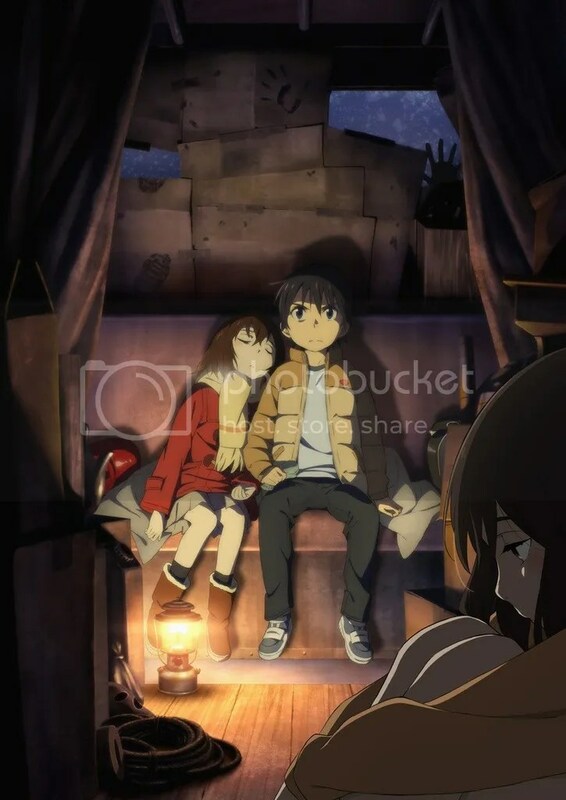 Well, I think that the developing connection between her and Satoru (well, not the romantic side of it) was one of best things in the show and it would probably have been better to either extend this arc to the whole season (and opt for another one to deal with the rest of the story) or shrink it somehow because after Kayo left the spotlight, Boku dake ga Inai Machi just lost a lot of its appeal to me. Yes, the story went on, but it was nowhere near as impactful as Kayo’s part was. Apparently original manga version tackles this and other issues a way better, but sadly the anime didn’t profit from cutting much of the material. Another thing connected with the composition is multiple time-travels. I guess if you add such an ability to the story, you try to use it as much as you can, but this time it felt like it broke the already established continuity and added very little to the plot. Speaking about the ending, it felt quite anticlimactic. As this is apparently more of a mystery anime, the true killer was actually pretty easy to determine and when the main guys have also done it, everything just ended without much emotions or consequences. I already addressed my problems with Satoru being an adult and a child at the same time. Well, it can be argued that all his life Satoru remained pretty childish – to the extent of running away when not knowing what to do, even if it works against him and could have easily been solved just by talking. Most of the other characters cause far less problems, being pretty much normal kids and adults. Apart from Satoru and Kayo I don’t think anybody received many developments, though that wasn’t something absolutely necessary. Yes, there is that one ridiculous and very random backstory element when a wife left her husband because of an allegedly stolen chocolate bar, but everything else makes more sense. That is till we encounter the villain and his motivations. That is if he had any. Some explanation is given about some hamsters and stuff, but does it feel satisfactory? Clearly nope. It almost looks like the villain’s motives were left to be included for the last second and that was done with the mindset of “oh bugger, no time for anything decent so this will make do”. Another probably more personal dissatisfaction was caused by the way the show treats the characters, more precisely all the numerous red herrings scattered here and there. I believe a good mystery can use them, but only in order to weave a number of possible strings of motives and actions of several different people that would enable to list them as suspects. The joy then is to find false leads and one after another eliminate them. In this case all the red herrings we get are limited to a single scene, say, a shot of an ominously enlarged knife next to a person who might be not that clean. And after that? No elaboration whatsoever, all those scattered scenes just suggest a suspect once and that’s the end of the story. Why would you waste a shot to tease the viewers with some sinister glance and then practically forget that? What A-1 Pictures really can do is to deal with all the artistic elements. And here? Well, it kind of worked out. For me character designs needed time to settle in, especially Satoru’s mother’s lips – it was a very long time since I could overlook those giant things that were looking almost like a moustache. Apart from that, everything looks quite polished most of times, though there were moments when far standing characters’ faces looked more like quickly drawn sketches and not finished products. More people versed in cinematography pointed out numerous scenes that had some metaphorical meaning, but you don’t even need that to simply appreciate the looks of the show. Interestingly, segments when Satoru was in his 10-year-old self were made to be in a ”letterbox” way. I believe it was a nice decision as it showed another overarcing theme of films as memories as well as the caged world between the stripes of black showing that Satoru himself is not comfortable in that time and place and has to deal with some serious problems. That’s all good and well, but what the show lacks is subtlety. I understand a wish to show some color symbolism but it’s a bit too much when every time someone acts like villain, their eyes just turn red. The main antagonist, once revealed surely must don his typical villainous smile, how else we would know he’s a truly bad guy? Even if the name of the OP song shown as a graffiti on a wall in the last episode is a nice touch, I doubt it should have taken the spotlight so much. All the already mentioned red herring stuff also adds a bit to this argument. Yuuki Kajiura was responsible for the soundtrack and that says a lot. Being quite a fan of her I just wished her music would have had more time to emerge from other background sounds and talks. There clearly were some shiny tracks but much was left covered with many layers of other stuff. Not knowing that it was her I would probably have not noticed the soundtrack at all for the most part of the show. Still, the composer knows how to create a very suspenseful atmosphere (basically similar to Kara no Kyoukai films). In that regard the soundtrack is definitely good, but it clearly doesn’t go very far beyond just being functional. The opening deserves a special mention for its song was Re:Re: by Asian Kung-Fu Generation. I’ve known the band for some time but namely this opening lead me to investigate them a bit more and oh well, I’ve got another band to add amongst my favorite ones. Check the band out if you will. All in all, I think Boku dake ga Inai Machi at least deserved all the fuss around it. Production quality was good more times than not (no wonder when the director has worked under Mamoru Hosoda if I’m allowed not to mention his job with Sword Art Online), the premise was pretty unique, even if less time jumps would have been sufficient. It’s interesting how after this show the amount of anime with time travelling elements appears to be increasing so we can talk about some influence. Nonetheless, series composition, numerous conveniences, problems with subtlety and generally unsatisfactory ending drops the enjoyment not that high after all. Many people think the show’s great and it probably did a splendid job adapting all the material with all the means available. That said, all the nitpicking thoughts somehow prevented me from getting invested emotionally very much and while I certainly appreciate all the effort, I can’t say that my opinion of the show is very high. I guess you should check the show out (though most likely you have already have – Boku dake ga Inai Machi can boast higher popularity than such grands like Trigun or Mononoke Hime). Don’t believe that it’s the best mystery, time travel or drama ever and you’ll probably have a good time for the most part of it. A-1 Pictures assembled some very talented creators but the end result wasn’t as good as it might have been, but it’s still worth a watch. Unless you haven’t seen Trigun or Mononoke Hime.